Canada’s oil industry has had a rough couple of months with production and exports taking a hit. Low oil prices are cutting into the profits of major producers. Producing from Alberta’s oil sands is costly and requires a high oil price to justify the expense. In fact, the fall in prices could significantly impact production levels decades from now. Oil companies are shelving large investments because they no longer look profitable. For example, earlier this year Royal Dutch Shell abandoned a potential 200,000 barrel-per-day oil sands mine. Overall, Canada’s oil patch could see a $23 billion cut in investment in 2015, a decline of almost a third from last year. Unless oil prices bounce back, a lot of projects may not move forward. But again, a lot depends on what happens with oil prices. The decision by OPEC to play for market share doesn’t bode well. “It really depends on how long OPEC decides they want to keep pricing at this level with their quotas that they’ve established,” Greg Stringham, CAPP vice-president of markets and oil sands, told the Financial Post. The contraction underway in Canada’s oil sands has been hugely damaging to the broader Canadian economy. First quarter GDP declined by the most in over six years, falling 0.6 percent on an annualized basis. The figures stunned most economists who had expected modest growth, and it indicates that Canada’s economy is feeling the pain of low oil prices much worse than previously expected. But aside from oil prices, several short-term events have also taken their toll. Several major oil sands projects were taken offline for maintenance. And a sudden outbreak of wildfires forced oil sands producers to shutter some major sources of production. Cenovus Energy shut down its Foster Creek project in May due to the fires, reducing output by 233,000 barrels per day. The fires, combined with planned maintenance, have slashed Canada’s oil production from 4.59 million barrels per day down to 3.98 million barrels per day, or around 10 percent of total production. The fires could knock off 0.3 percent in growth for the second quarter. Crude-by-rail shipments fell by 25 percent in the first quarter, down to just 120,000 barrels per day, although part of the reason for that is because several pipelines have been completed, diverting oil off the rails. Shipping oil by pipeline can cost under $10 per barrel, whereas moving it by rail can add $15 to $20 to the cost. Environmental groups see the fires that struck oil sands producers as a sort of sick irony, as wildfires are expected to become more common and severe due to climate change, which is being driven by fossil fuel combustion. So not everyone is upset that Canada’s oil production has recently taken a hit. 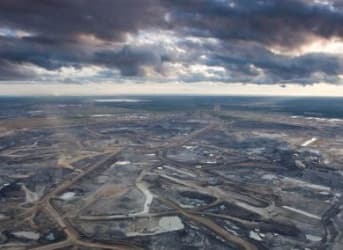 A group of 100 American and Canadian scientists signed a statement calling for a moratorium on all new oil sands development. “If Canada wants to participate constructively in the global effort to stop climate change, we should first stop expanding the oil sands. More growth simply shows Canada has gone rogue,” Thomas Homer-Dixon, professor of governance innovation at the University of Waterloo, said in a press release. For now investment is slowing. But that would change if oil prices rebound. Come on folks we all know new technology is available today to push oil down to 10 bucks a barrel. Things are going to change a lot faster than people think as we move out of petro into the new nano age of energy.